We recently recommended several places that are serving up delicious Bolognese and promised more. So here is our second, and last, installment of 2013 Recommended Pasta Bolognese of Fairfield County that includes two slight variations of the traditional sauce, one with chicken and another with oxtail. Let the games begin...and let the lipitor flow for these 2 brave diners who sampled Bolognese from all over Fairfield County. FromCotto in Stamford to The Spread in SoNo to Louie's in Cos Cob, we bring you tasting notes on 10 more Bologneses. The sauce at Columbus Park Trattoria is based on a family recipe that Maria Marchetti brought with her from Southern Italy in 1985. All veal, no dairy, a touch of white wine reduction, this Bolognese is distinguished by an unexpected sweetness. Sugar? No, the confection results from removing the seeds from sweet Italian whole tomatoes, which reduces most of the bitterness. Maria and her son Michael also flavor the root vegetables with garlic cloves that are quickly removed to avoid any astringency. The menu offers the Bolognese sauce paired with potato gnocchi, but is best complemented with one of Maria’s toothsome egg pastas. The Bolognese ratios at Emme of Capri are fantastic. First there is twice as much meat as veggies and liquid; and then there is an equal amount of sauce and pasta. 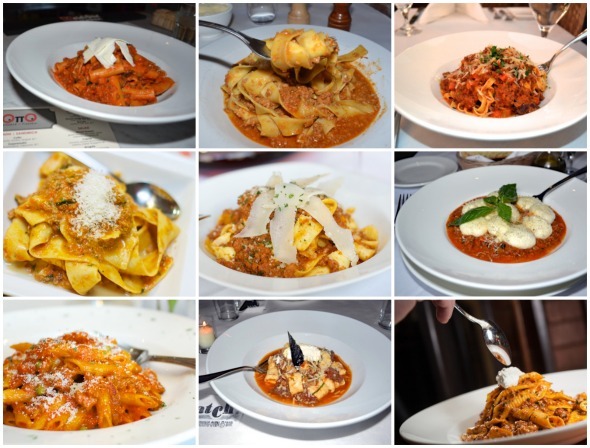 Yet the fresh, extravagant flavors of chef/owner Massimo Vallone's fettuccini Bolognese are anything but formulaic. The sauce, which is 100% pure veal simmers all day and is finished with dash of cream. The result is a Ragu that's hefty, yet smooth. Northern in origin, southern in execution, Massimo's Bolognese is one of the best in lower Connecticut, for any season. But shut your eyes and you could be seated at a table in the cliffs of Positano…the Isle of Capri shimmering off summer's shore. Chicken Bolognese? For many, poultry ragu is an oxymoron. But for some, owner / Chef Colin Ambrose's twist on a traditional Bolognese offers an alternative to the classical beef driven sauce. Because each dish is prepared to order, the texture of the sauce is more of a mixture than a meld. Tomato flecks float with parsley in the dairy infused sauce to impart more flavor and color and add to the sense of lightness. One quibble: because the sauce is less dense than a rustic beef ragu, the heavy pappardelle seemed too strong a pasta partner. If you still think of chicken Bolognese as heresy…Chef Ambrose also offers a vegan version. You will not find Bolgonese paired with spaghetti anywhere In Italy, the long thin pasta is considered too demure to harbor affection from a rough ragu. But at Louie’s, the "bol" clings to the "spag" quite snuggly. At tableside, the waiter deftly winds the pasta and sauce into loose knots before serving. The secret of the embrace may lie in Louie's lighter sauce, comprised of beef, sausage and an ample amount of tomato paste. The portions are generous at this family-centric neighborhood tavern and trattoria. But a waitress whispered that Polpo, a sibling to Louie’s, served even better Bolognese. Read if we agree, below. Chef Matt Storch serves a traditional Bolognese at his Chelsea Restaurant in Fairfield but we wanted to include a slight variation with his ragout of oxtail and short ribs served with ricotta gnocchi. The sauce begins with two separate braises; one of short ribs with accents of orange, ginger and tomatoes and the other for the oxtail braised in red wine garlic and rosemary, then combined and served with ricotta gnocchi and topped with whipped ricotta. The end result is a hearty ragout that is smoothed by the delicate gnocchi. The whipped ricotta adds addition creaminess and a contrasting coolness to the dish. The Bolognese at Polpo was outstanding, robust with beef, veal and pork. There’s the requisite mirepoix and San Marzano tomatoes, but meat dominates Chef Carlo Apolloni’s high density non-dairy sauce. It pairs perfectly with the off-the-menu Pasta alla Chitarra noodles, a dry square spaghetti, hand-made on an ancient guitar-like cutter, used for centuries by the farmers of Abruzzo. For trendy Polpo, it’s pasta with a pedigree, albeit a peasant one, and combined with Carlo’s rustic sauce, this dish enjoys both snob and mob appeal. One of the most popular entries on the otherwise upscale menu, the dish is also available as a half order. Insist on the Chitarra, very few spaghettis can handle a Bolognese. The Spread is one month old and Chef Arik Bensimon is immediately back presenting delicious cuisine, including his incredibly rich sauce. Staying true to the classical recipe Chef Bensimon begins with a mirepoix to which he adds beef, veal and pork, wine, cream, tomato paste and tomatoes before he simmers the sauce for several hours. To finish the dish he adds more cream and butter and combines with his house made fettuccini. The end result is an incredibly rich combination with the mild fettuccini offset by the rich and silky sauce. 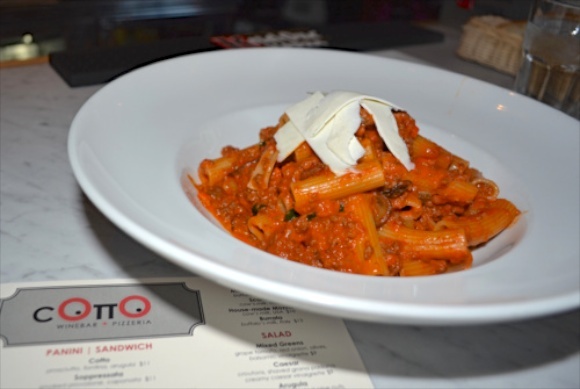 Chef David Raymor has a different approach for the Bolognese at Strada 18, relying solely on veal. To this he adds some ground house-cured guanciale. The flavors are sweeter than some and the pungency of the meat adds good depth to the sauce. There is a good amount of sauce surrounding the meat that allows for every bite to have an abundance of tomato and meat. The house-made pasta is perfectly cooked to al dente, has a silky texture and is slightly thicker than many of the other restaurants.